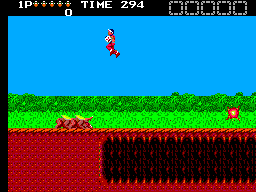 Argos no Juujiken is a Japanese SMS platform game based on the arcade game Legendary Warrior Rygar. 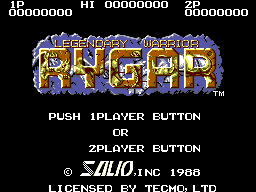 This patch replaces the title screen of Argos no Juujiken on the Sega Master System with the title from the arcade game Rygar, on which this port is based. The colours have been reduced to match the Master System’s palette, but the title itself is a pixel-perfect representation. The patch expands the ROM to fit the extra graphics in, and the logo takes slightly longer to appear on-screen due to the extra graphics tiles required.